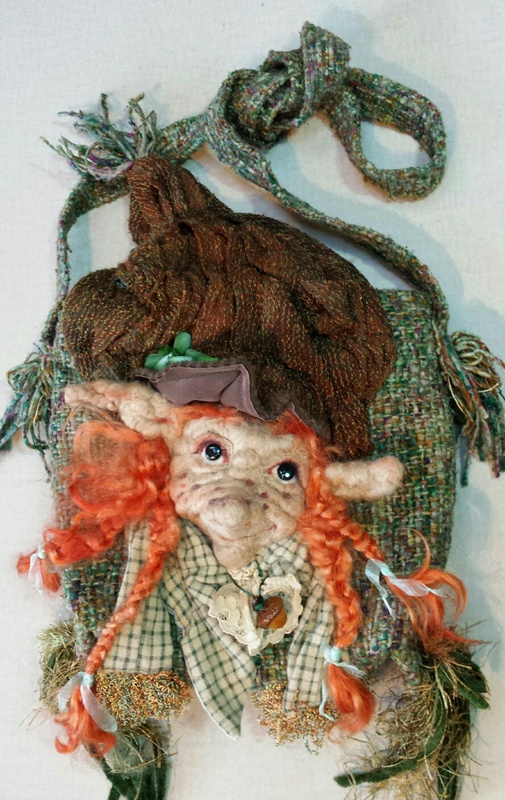 Now the friendly face of your faerie companion can go with you on all your adventures! The faces are hand felted wool, with mohair braids and a real acorn necklace. A sparkle will always be in these eyes of hematite beads or polished leather antique buttons. Their hats are the top flaps with a magnet enclosure. The 9 x 9 x 3 inch outer shells are made of sturdy weight raw silk or velvet, just roomy enough for phone, sunglasses, eyeglasses, wallet and water bottle. The inside lining is heavy taffeta with side pockets for phone and pens. Somewhere, tucked in the folds around this character, you will find a tiny secret pocket with a crisp dollar bill rolled up in it. Yes, you will....but why? This is in keeping with the faerie stories of ample supply. As long as you never spend that dollar, your purse will always be full, just like the faerie gifts of the ever filled bag of flour and endless ball of yarn!